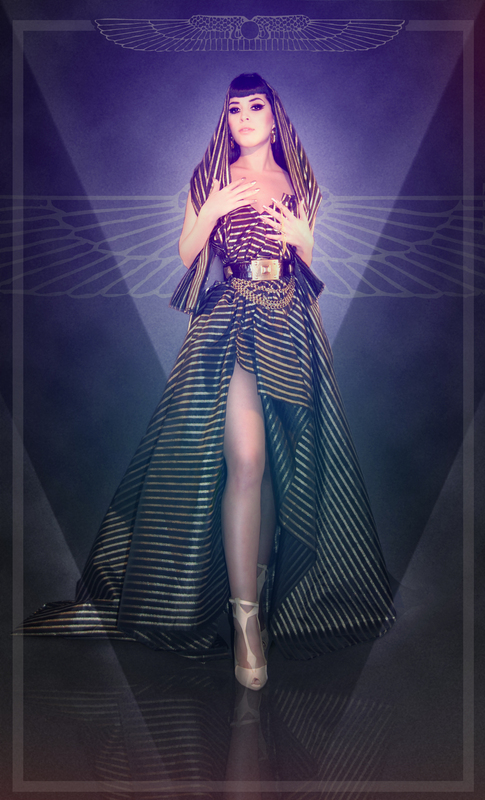 EVOL HEIST just launched their new fiery collection called “EGYPT” and it is to DIE for. This fiery collection is inspired by all the beauties of Egypt with Ankh rings that have chain links, striking bolo ties, necklaces fit for Nefertiti, and earrings inspired by pharaohs and pyramids. I was asked to model the entire collection and who better to collaborate with me on it than my favorite cultural artist and best friend Derek Santiago. Santiago not only photographed me but he edited these pictures and created pure art. Speaking of art, I found this gold and black striped fabric at a fabric store and thought it would be cool as a backdrop. Low and behold after scowering through my closet and not finding anything I decided to make a dress out of the fabric I purchased. I wanted to create something Avant Garde and I did just that by draping the skirt so that it had a slit through the leg and creating an abstract sweetheart neckline on top. I needed it to be versatile so I created a vail that would soon turn into a bandeu top. 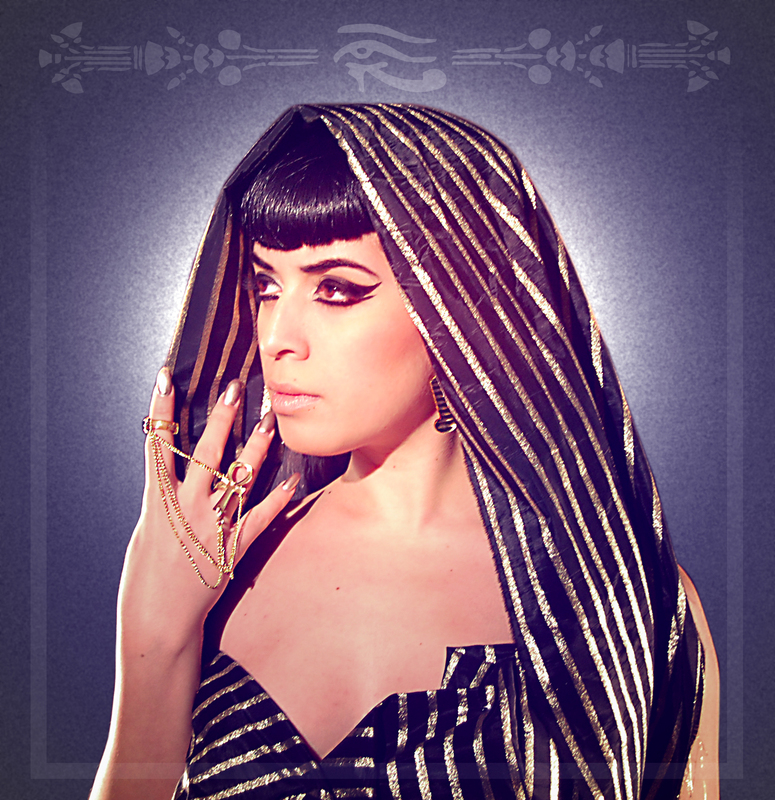 It was the perfect canvas for the beautiful jewelry and I couldn’t be more happy as Nefertiti or Cleopatra. Both women were an inspiration to me since I was a kid painting henna on my hands with temptu ink. 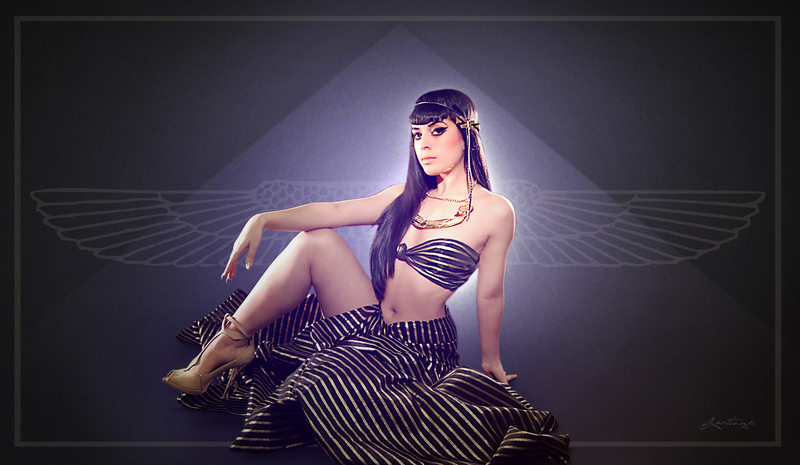 I was also Cleopatra for Halloween in 05′. 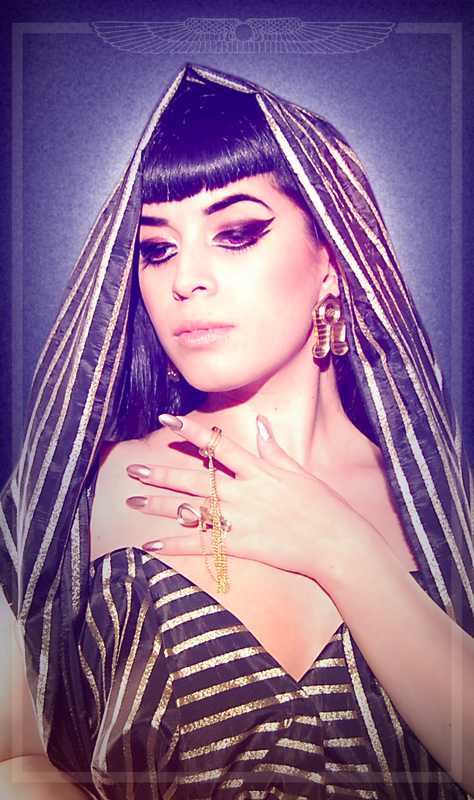 This photo shoot was long overdue and what better time to do it than now, decorated in beautiful Egyptian jewelry by Evol Heist. Inside you will see more photographs with descriptions of the Jewelry pieces. The Ankh Cross represents life (immortality) and death, male and female, balance. It can also represent zest, joy of life, and energy. It’s closely related to the looped cross that can mean fertility and life. The word pyramid itself means fire in the middle. Pyra / o = fire & mid = middle, i.e. fire in the middle. It doesn’t mean fire in the gross from that we see it in the world, but rather the subtle fiery generation located in all things phenomenal, that is the ‘life force’ of the cosmos. 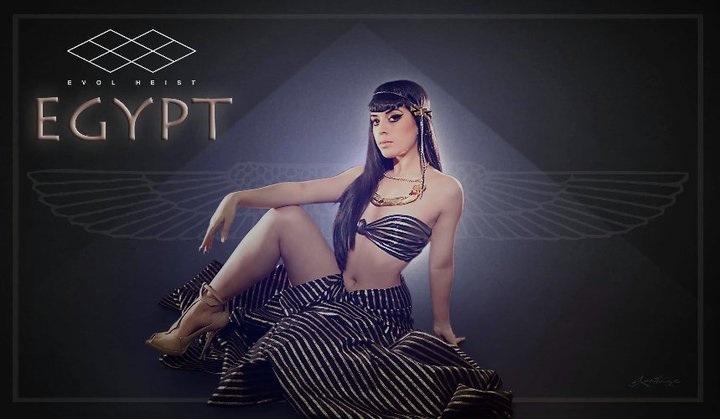 Pharaoh is a title used in many modern discussions of the ancient Egyptian rulers of all periods. The title originates in the term ‘’pr-aa’’ which means ‘’great house’’ and describes the royal palace. The title of Pharaoh started being used for the king during the New Kingdom, specifically during the middle of the eighteenth dynasty. Click Image above to be directed to the Evol Heist website! Assisted by: Ingrid Campos & Enchante Aparicio. ← Vintage Finds for Spring time! Great Pics, beautiful dress & accessories! You are stunning as always! I love these pictures! You are truly a Goddess, the jewelry is stunning, and the photograghy is awesome! You have done it again……Simply Beautiful. I can not believe how incredible this set turned out. Blew me away. You guys are on point. hi! i’ve been following your blog and i think your style is quite amazing. you have such an eye for the unique and beautiful. you’re style always leave me inspired. Absolutely gorgeous!!!! i have such a talented cousin who surrounds herself with talented and amazing friends as well!! You guys did a fabulous job!!! Loved everything!! With these pics it just goes to show that we need an official line from you! This is by far my favorite photoshoot, and Derek has such a great eye! Gorgeous! Absolutely Stunning. I’m dumbfounded how amazing this looks. I have nothing but complimentary things to say about this. Truely inspirational. Wow!!!! This photoshoot is awesome and you are beautifull !!!! Thank you-love your philosophy on individual style-not only are you fascinating-absolutely stunningly gorgeous!